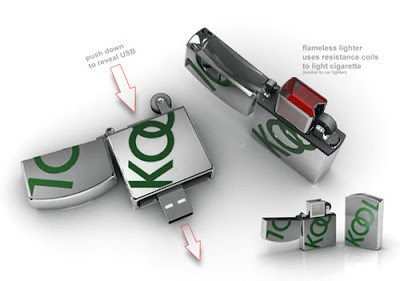 Nathan Gabriele designed a cool flame less USB Cigar Lighter gadget for fashion lovers. This lighter uses resistance coils powered by battery cell to create heat. The technology used in the lighter is the same technology found in car lighters. The small rechargeable batter powering the resistance coils can be recharged via USB. On top of that there is a flash memory to store content. It is one of the cool USB which does multiple things.